Hummingbirds are the smallest of all the birds and are found only in the Americas. 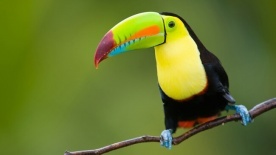 There are over 330 species in total, and more than 50 are found in Costa Rica. There are 2 species of hummingbirds that are ONLY found in Costa Rica; the Mangrove Hummingbird, and the Coppery-headed Emerald. Their unique anatomy and their flight patterns make hummingbirds one of the most interesting of all the families of birds. 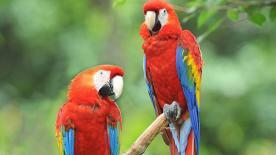 In spite of their size many of them can cover thousands of miles in their migrations. Imagine a creature weighing just a few grams making the journey from the Aleutian Islands to Baja, California, or the tiny Ruby-throated hummingbird that travels from Canada to Costa Rica! People like to place feeders with sugar water to attract the brilliant little visitors. The hummingbirds quickly learn that a feast is waiting for them, and they will visit the feeders regularly. They are jealous and territorial too. Hummingbirds will spend as much time defending their feeding spots as they do feeding. One can sit for hours observing with awe these “sugar stations”. 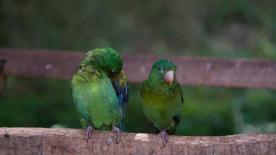 In locations like Monteverde, Cerro de la Muerte, and La Virgen, visitors can see 20+ species at a single feeder. Hummingbirds considered by some, the jewels of all the birds, are very important pollinators. They develop some of the most specialized relationships with plants and flowers. The shape of the bills of some hummingbirds have developed to perfectly match the shape of certain flowers. It is an exclusive relationship of pollination between the hummingbird and the plant. 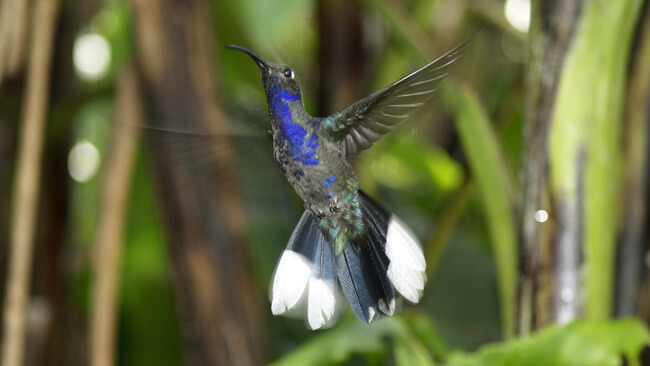 Throughout Costa Rica, whether in the rain forest, or in a hotel garden, visitors can expect to see and enjoy the flashes of color, the spectacular plumage, and the wondrous flight of the hummingbird.